Sorry for the delay in posts, guys. Today has been crazy! Let's get right to it: I can take no credit for this gingerbread how-to. My pal, Starr, comes from a long line of skilled gingerbread makers and she was kind enough to share all her secrets and recipes with me (ok, they probably aren't seeeecrets per-say). She even came over this afternoon and mended my gingerbread house after I had accidentally elbowed it off the counter and onto the floor (I wish you all could have been flies on the wall when that happened). 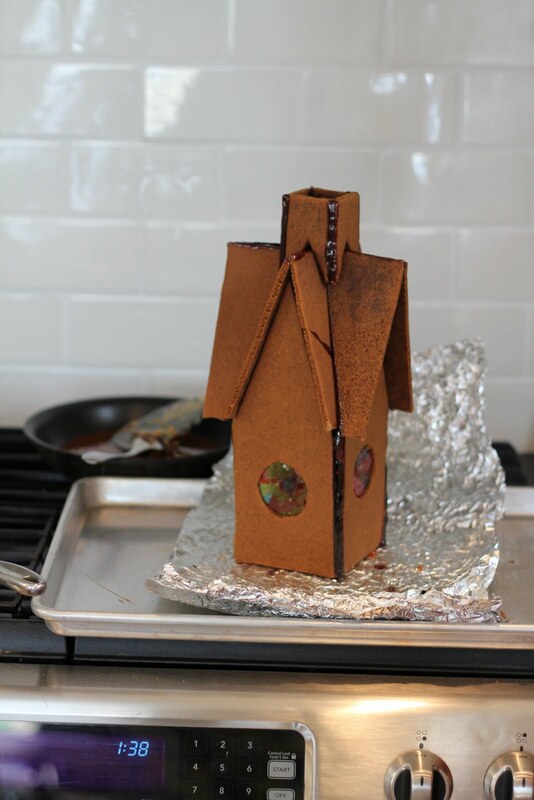 The end product is a charming little gingerbread cottage with a lotta personality. I hope you like it and I've included a PDF of the pattern so you can make one of these little sweeties too. Enjoy! Sift all dry ingredients in a medium bowl and set aside. Cream together sugar, shortening, molasses, and egg yolks. Add dry ingredients slowly to wet mixture and mix thoroughly on high, stopping a few times to scrape bowl down with a rubber scraper. The dough will be quite stiff. Set aside. Tear two sheets of aluminum foil a few inches longer than the length of a cookie sheet. Lay sheets of foil into clean cookie sheets and crease foil with finger to indicate the exact size of pan. Preheat oven to 375 degrees. Remove foils to countertop. Divide gingerbread dough into two equal sized balls. Place balls on foil for rolling out. Using a rolling pin, roll the dough into a thin sheet (1/8 "-1/4" thick) that is relatively the same size as the cookie sheet. 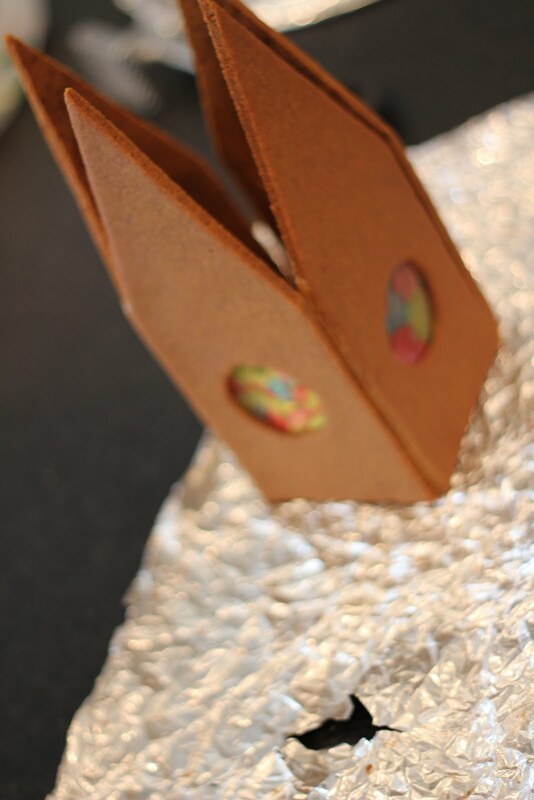 Use the crease in the foil as a guide for how long it needs to be. You can trim any gingerbread that overlaps the foil and mold it on edges where it's needed. Follow these same instructions for the other dough ball. Pick up edges of foil and place each sheet of dough into cookie sheets. Print the pattern off and cut each pattern piece out and write how many pieces you will need to trace on each cut out. Now you are ready to trace your cut-outs! Place a cut-out on the sheet of dough and trace the cutout gently using a small pointed knife. Be thoughtful where you cut things out so that you leave enough space for all the pieces necessary. You can fit the pieces together like a puzzle to save space and decrease the amount of cutting after baking. Don't pick up excess pieces of dough. Leave everything in the cookie sheet. This keeps the gingerbread from spreading while it bakes. Now, cut any windows and doors that you desire (don't remove and excess gingerbread here as well). I used a lid of baby food to trace my windows. Before baking make sure you count each piece to make sure you have enough of each. You should have: 4 chimney pieces, 4 angled roof pieces, 2 square roof pieces, 4 walls with pitches, 4 base sides (optional), and 1 square base (optional). Bake in a 375 degree oven for 6-8 minutes or until medium brown. You can do both at the same time or do them in batches. Remove from oven and immediately cut (carefully) using a small pointed knife over the lines already traced in the dough. Lift out scrap pieces and allow the pattern pieces to cool in the cookie sheet. Save the door that you cut out though! The scrap pieces can be used to make other elements to the gingerbread cottage: a fence, trees, furniture (if you are feeling ambitious), or decorations. Or you can happily nibble on the scraps. Take each gingerbread piece off the cookie sheet. Discard the old foil and place a fresh sheet in each pan. Place gingerbread pieces back in. This is an optional step, but I think it is a must! It'll give your little house that WOW factor. Here is what you do: Crush up some jolly ranchers in varying colors or specific colors depending on your preference. Place broken jolly rancher pieces into each of your window cut outs, filling in the whole space. Bake in a 375 degree oven for 2-3 minutes or until the jolly ranchers are completely melted and the surface is smooth. The windows will look like stained glass! When house pieces are completely cool, they should be stiff and ready for assembling. If for any reason the gingerbread is still soft and bendable, simply place it back in the oven for a few more minutes. Watch it carefully- burned gingerbread is not good and it crumbles easily. To assemble the house you will need to make sugar glue, or you could use royal icing (scroll down for royal icing recipe). In a heavy pan, over medium heat, melt a 1/2 cup sugar. Stir often. When the sugar is bubbly and pourable, it is ready. Keep in mind, you can always add more sugar if it starts runs low-- pour in more sugar and stir until the crystals have dissolved and it's bubbly and liquified again. Start by gluing the four walls of your house together. Take two wall pieces. Dip the edges of both pieces into the sugar glue and then join them together. Try and adhere the edges together quickly after dipping. Be careful- the sugar can drip and burn you! Do the same for the remaining wall pieces. You can use a spoon to help you pour more glue here and there if needed. The house will not be perfectly even and that is ok.
Now you need to assemble the roof. Take the two square roof pieces with notches. Dip the top edges (opposite of the notches) and glue pieces together to form an A. Rest the glued A piece on top of the house. You can place it on a couple different ways to see which way looks better. Now you are ready to glue on the angled roof pieces. On these pieces there is an angled side and a straight side-- make sure you glue the angled side to the roof not the flat side. Again, the edges are all not going to match up perfectly. In the end, it adds charm and appeal. Set chimney aside for later. The house needs something to rest on now. I used an upside down pizza pan, covered in foil. You could also use a piece of sturdy cardboard that you cover in foil. I wanted my house to be raised up a little so I glued the house using royal icing (scroll down for recipe) on top of a small upside down plate (covered in foil) and then glued the small plate to the pizza pan using royal icing. You could even use some of your left over gingerbread scraps to raise yours up a little if you wanted. You really can't go wrong-- just make sure you use royal icing to secure everything. Finally! It's time for the fun part: the decorating! There are so many creative ways to decorate these. Here are some ideas: starlight mints, pull n peel licorice, frosted dots, candy canes of all sizes, pretzels for a fence, chocolate covered raisins for a path, red hots, m&m's, sixlets, sparkling sugars, coconut, marshmallows, etc. 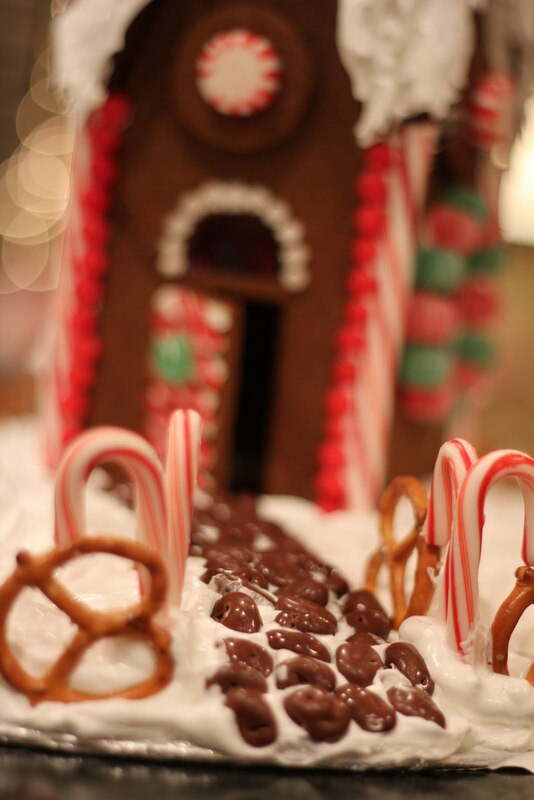 To glue the candy onto the gingerbread house you will need to prepare royal icing. Use the royal icing to pipe borders and decorations on the gingerbread house as well. For example: I piped a little star border around the window above the door. Mix all ingredients on high for 4-5 minutes. Use a stand mixer for best results. Royal icing will begin to set up fairly quickly so make sure you cover the bowl when not using. You can dye some of the icing if you want another color besides white. Pipe royal icing over any exposed sugar glue and/or use candy. After you have finished piping and placing candy on the house, you need to make the glossy meringue frosting which acts as the snow. Pour egg whites into bowl of stand mixer. Whip on high. While the egg whites are whipping, bring to a boil sugar, cream of tartar, salt, and water in a small pan. When the egg whites are fluffy, slowly pour bubbly sugar mixture into egg whites while beating. Whip for 7-10 minutes. The mixture will be shiny, light and fluffy. Spread and swirl meringue over the roof of the house in an aesthetically pleasing way. Take chimney and rest it atop the house. Decorate the chimney with glossy meringue or candies. Spread and swirl the meringue on the base (the yard of your gingerbread house!). Make a fence around the perimeter using candies or pretzels. Make a pathway using chocolate covered raisins or other suitable candy. I made some trees to place in the yard with some left over gingerbread pieces. I covered them in a little meringue, glued a few sixlets on and dusted some sparkly green sugar over the top. Keep in mind, the glossy meringue will start to set up-- you'll know because it will start to drag and not look as smooth. Try and avoid this. The glossy meringue and royal icing will be really firm and secure after a night of drying out. I love this! Nice work ladies! Too bad I'm not patient enough to make one of my own. This is soooo cute Bri! I love it! I love the windows! Um, that is awesome! Holy cow! We can't make gingerbread houses in Hawaii. We'd have roaches and ants crawling all over them within the hour they were complete :). I'll maybe just take a picture of this one, Bri, and put it on my table! Holy cow that is charming! Looks great! Whoa. I can't imagine how long that must have taken you to make everything and photograph every single step. You're a saint. 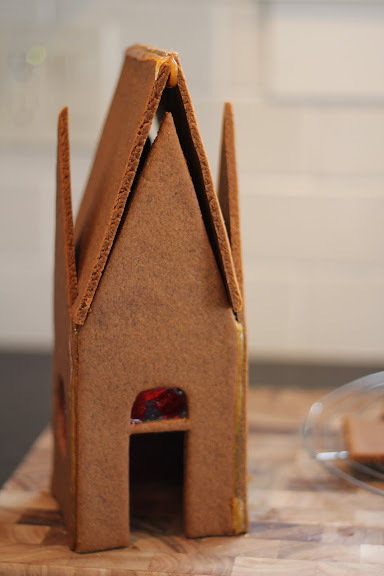 Got any tips on how to keep the gingerbread out of your belly before it becomes an adorable house? P.S. Stained glass windows - are you kidding me?!! I'm guessing that was one of Starr's secret touches. Wow. Every other gingerbread house is going to look so white trash to me from now on. I love that last picture with the twinkling lights from your tree in the background - what a shot! Finally getting around to reading this--looks awesome! Nice work Bri. I've got to come and see it in person. An impressive first go! You've got the skills. I have a question regarding the recipe for the glossy meringue icing. I tried making it to test it because I want to use it to cover all of my gingerbread house. I put some on a piece of cardboard and let it sit out over night. It was still sticky this morning. Will this dry completely hard or does it stay sticky? I have been searching the internet looking for an icing that is shiny and fluffy and will dry completely. Yours is the only one I found that stays shiny. Thanks in advance for your help, and you make beautiful gingerbread houses. The glossy meringue definitely will harden up after a couple nights of sitting, untouched. I typed that it would harden overnight and I was wrong-- it will take a couple nights before it hardens. Hope this was helpful! Thanks for your nice words. Tried to find the pdf template, but wasn't successful. May we have your TEMPLATE, please?